Today I am going out to visit the very smallest of small-scale porcelain stone clay making workshops. 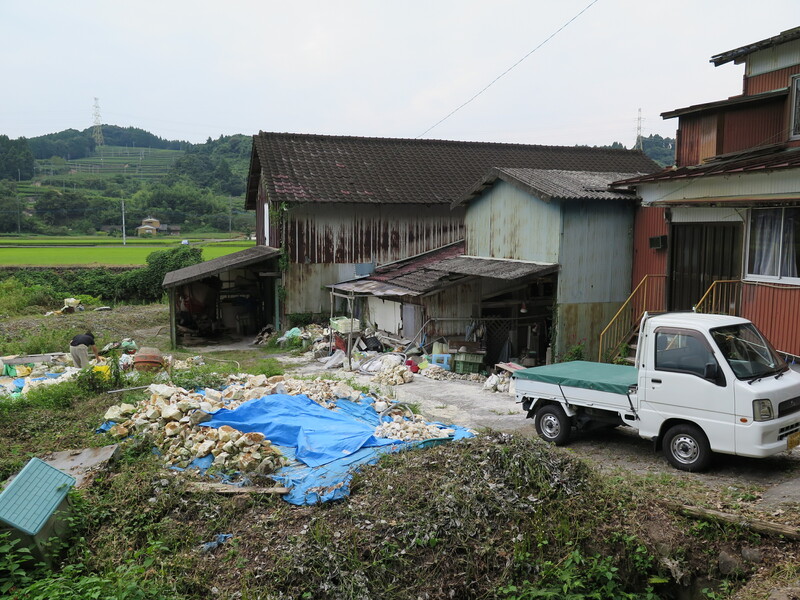 This family have been crushing and grinding the local porcelain stone here for four generations. The building is located so far out of town and in such an isolated place, that even my friend and driver, who is a local, has difficulty finding his way there. So many little winding roads and intersection. Eventually we arrive. 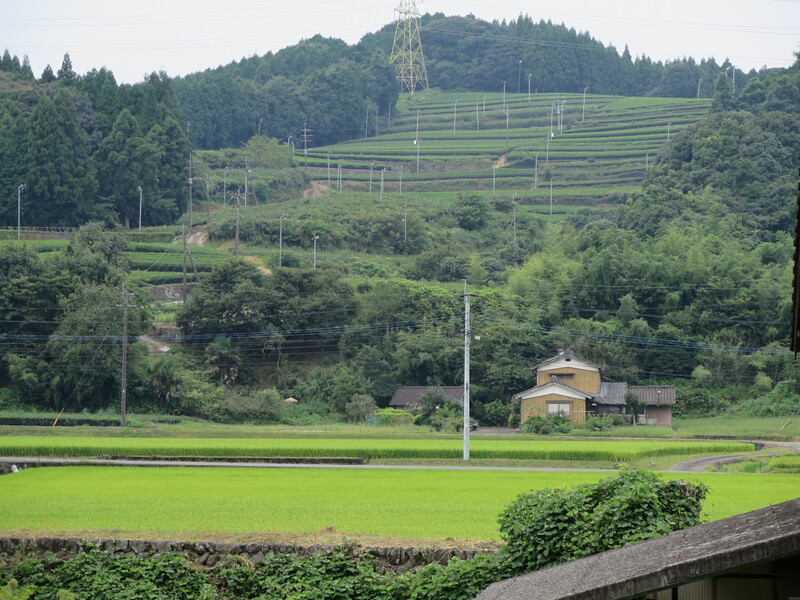 Another liminal site, perched just above the edge of the rice paddies, on the edge of the farm track and just below the tea plantations higher up the hill. The family building is absolutely original and built by the great-grandfather here over 100 years ago. It’s a beautiful old wooden structure. 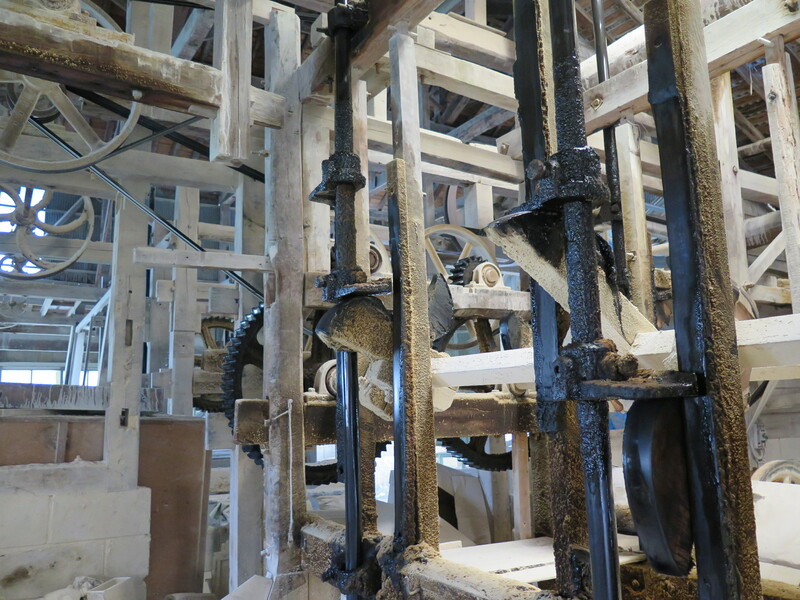 Even the supporting frame-work for the stamp mills is completely original and made of wood. The machinery looks pretty original too, especially the stamp mills. The only real concession to modernity here now are the filter presses and the vacuum pug mills. 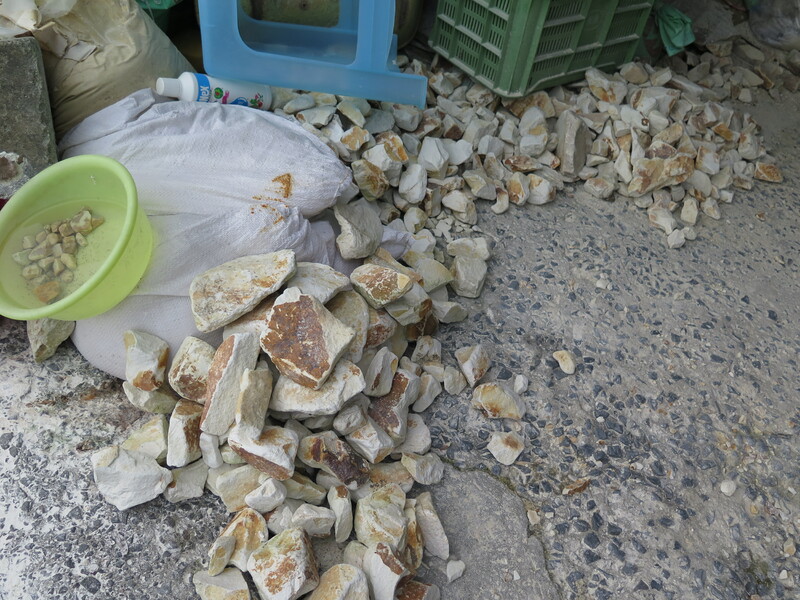 On the other hand, this small ‘Fuchino’ family run business puts in a lot of effort to hand sort and classify all the minerals as they are all dumped in a 14 tonne pile straight from the tip truck that delivers the stone from the quarry. First all the stones are sorted and classified into one of 3 groups. 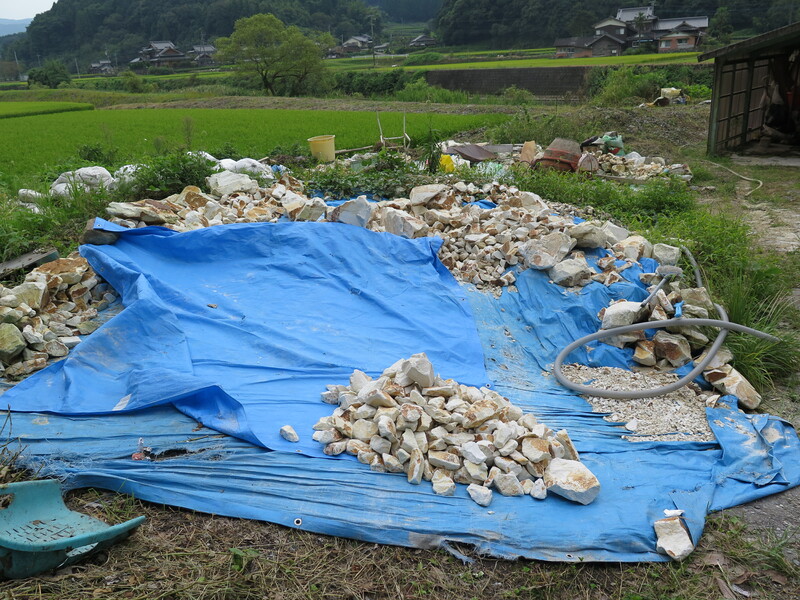 The native Amakusa stone is quite varied in its mineralogy with bands of various minerals throughout the deposit. The quarry doesn’t really discriminate that much. A truck load of this mixture can be processed all together as one composite material, as happens at the ‘Tajimi’ and other two clay makers. Here they spend an enormous amount of time sorting and classifying the mixed load into its components. There is felspar, silica and mica. The silica is deeply inter mixed with the felspar and looks for all intents and purposes, the same as the white sericite mica. However, there is a subtle difference in colour and weight. Added to this there is a very slight difference in hardness. Going on these minor differences alone and using 40 years of experience. The miller can tell the difference instantly and throws each of the stones onto a different pile as it passes through his hands. To complicate matters, there are veins of iron, that have been leached from the parent material over the millions of years and found itsself concentrated in the cracks that permeate the mass of rock. The iron is slowly leached from the degrading stone as it weathers and concentrates there in the cracks and fissures in wet periods and then dries out and becomes insoluble. This concentrate of iron in the cracks, builds up over the millennia and makes for a red, orange, brown, blackish surface coating around each lump of rock. To get the best result. The miller sits and patiently chips away the iron coating on each stone, to reveal the white mineral content inside. Hour by hour, day by day. The miller and his wife and son chip and scrape their way through the entire 14 tonnes of hard rock, until it is all sorted and cleaned. It takes them one month to process the 14 tonnes of stone. 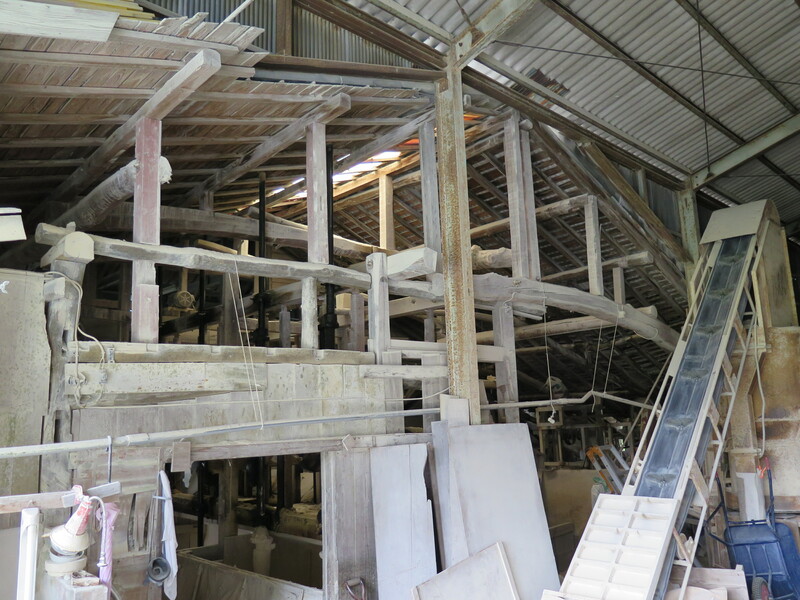 The result of this gargantuan effort of exacting perfection is three piles of stones which are processed separately. First they are put through the stamp mills and reduced to a fine powder. 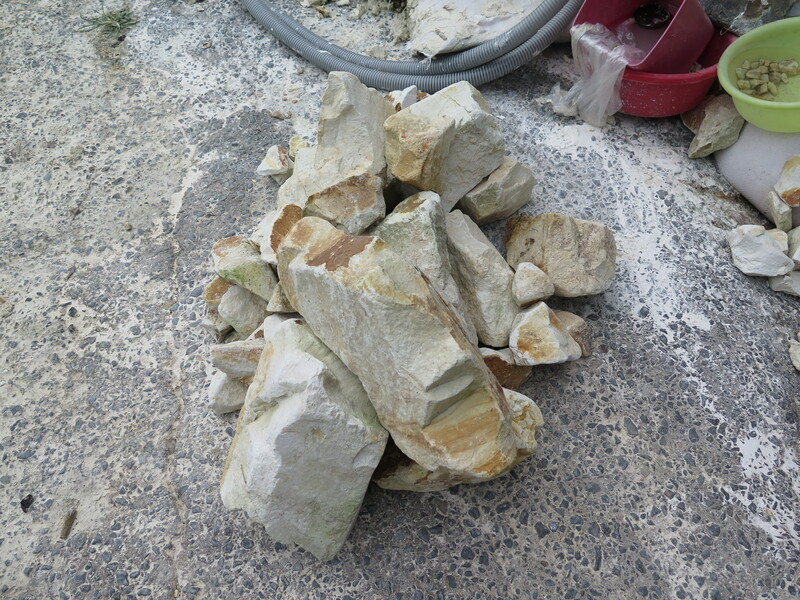 It is then sieved and sorted again before blunging and sent to the levigation tanks, where the heavier, coarser silica particles are sedimented out and the finer clay and sericite mica fraction is floated off. 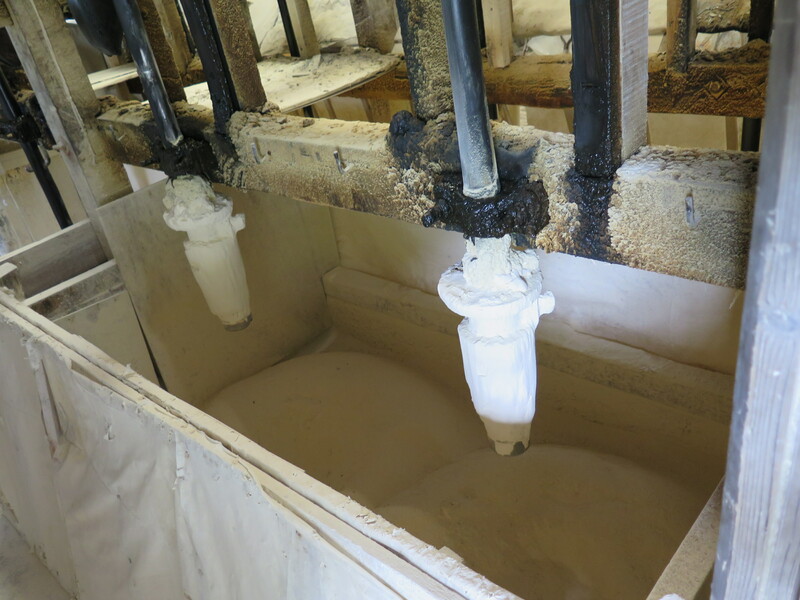 This slurry is then concentrated and stiffened using a filter press, the only concession to modernity introduced since the great-grandfather built the operation over a hundred years ago. The stiffened filter cakes are then vacuum pugged and bagged ready for delivery. 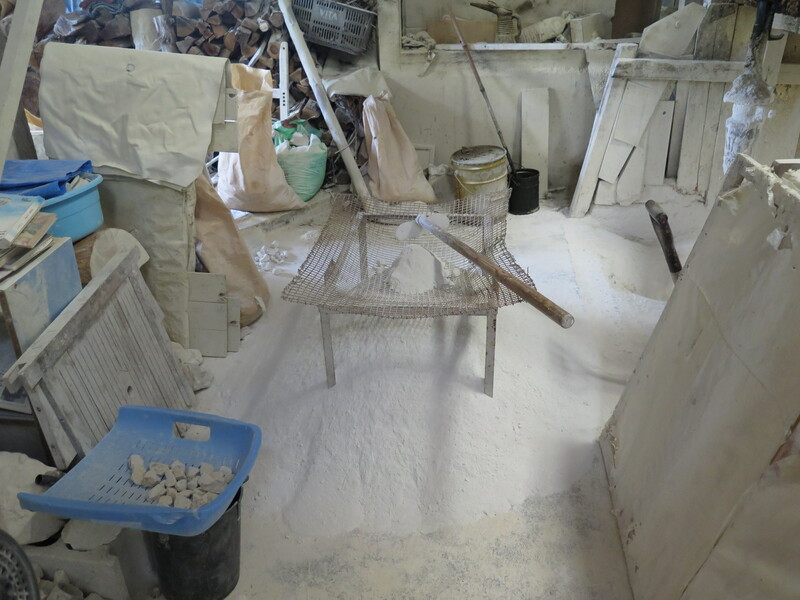 The number one product is a very fine white sericite and kaolin based body perfect for the creation of the wheel thrown items. It fires pure white and translucent with perfect glaze fit. This is obviously the most expensive grade and is in very limited supply. 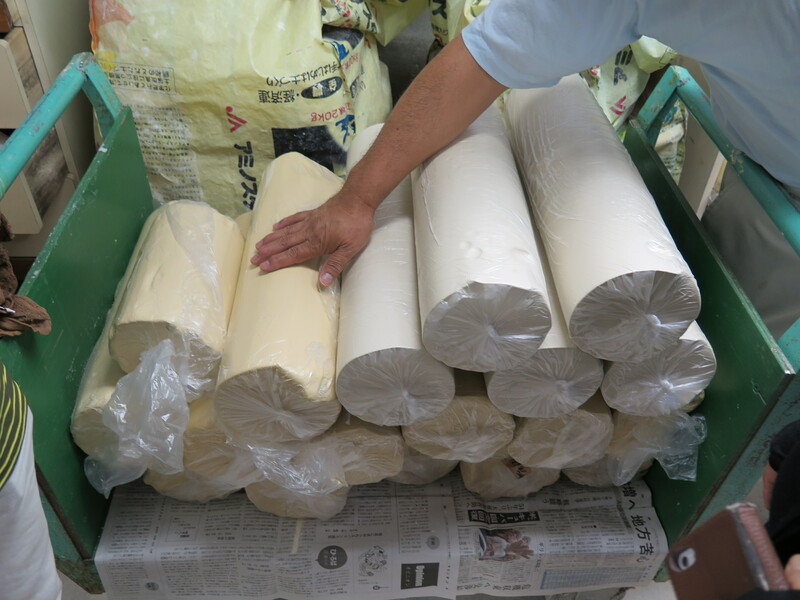 The second grade material is creamy white, with a slight iron contamination, but only very slight. It fires white and translucent with perfect glaze fit. Number 2 body is plastic and throwable, just like number 1 body, just not as pure white. The third grade is somewhat yellowish and is made up of all the chipped, hammered, and scraped off iron fragments from the surface of the coloured stones. This is the cheapest grade and the least white, firing a bit grey, with reduced translucency and low plasticity, but with excellent glaze fit. During my life as a potter, I’ve spent years, cleaning and sorting my collected native porcelain stones. I never really mentioned this to anybody lest they thought that I was mad. Now I know that I’m not. There are at least three other people in the world who are as committed to excellence as I am. 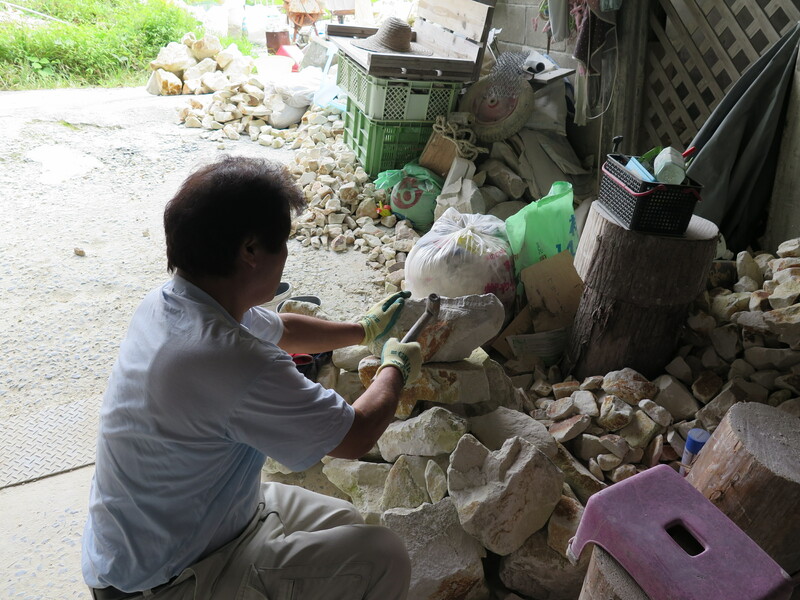 The difference is that this family are well paid to produce this special clay for the most famous pottery families in Japan, and can boast that they supply clay to at least three ‘National Treasure’ category potters. These famous, Nationally awarded potters couldn’t have gained their unique status without the sustained diligence and commitment to excellence of this family. It is an amazing experience to be able to be with these people, if only briefly. 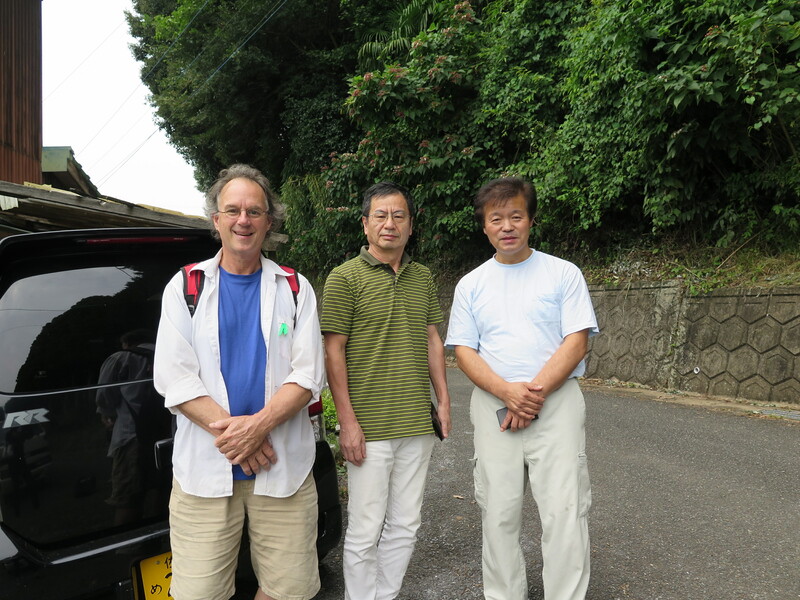 To see this old Wabi/sabi building. To learn of it’s long history. To speak with this couple. It’s all a bit amazing. They are so special and yet so ordinary and humble and uncomplicated. Just dedicated to their exacting work and very proud of their achievement. There is no other place like it in all of Japan, that I am aware of, and as this kind of work is pretty special to Japan. It might be safe to say the entire world. The effort that they have put in is rewarded with the status that they have achieved. I’m thrilled to get to meet someone a little bit like me and to be able to throw my pots out of this unique material. Needless to say there is a months long waiting list for this couple’s product. There should be a National Treasure Award just for clay makers like these, who work at a very unsexy job, but who have elevated it to stratospheric levels of excellence. I still find it hard to believe that it is possible to do what I have just seen with my very own eyes. I just didn’t really think that people still worked like this in a modern world. Taking so much time to be the best in the world, while not caring that anybody, other than their customers even know what they do. While we are there we buy 5 bags of this amazing stuff, but only the No.2 creamy white body today. There isn’t a skerrick of No.1 to be had for months yet. It appears to be all sold on advance order to the 3 National Treasure potters. I guess that this is one way of cementing your advantage over your other porcelaineous competitors? 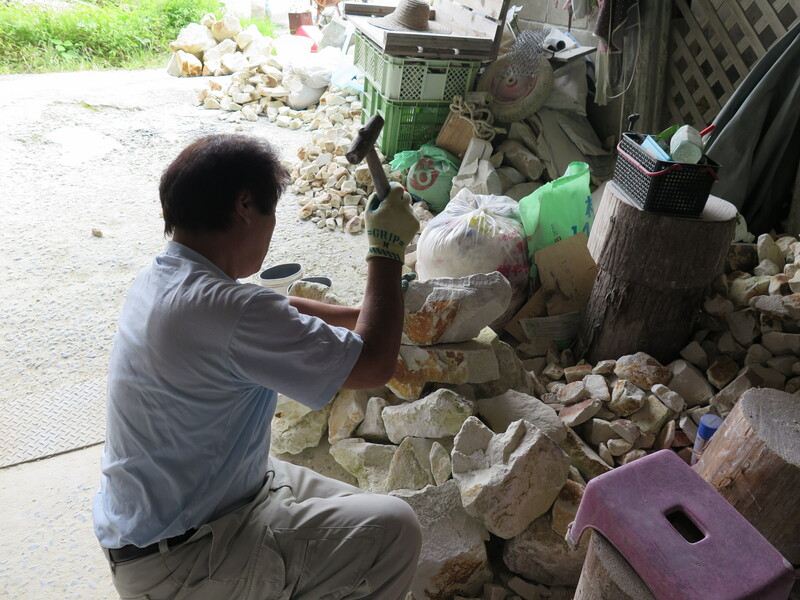 I consider my self so lucky to be associated with Tatsuya san, and therefore able to use both the creamy white and hand selected, ultra-pure white varieties of this family’s clay while I am here. 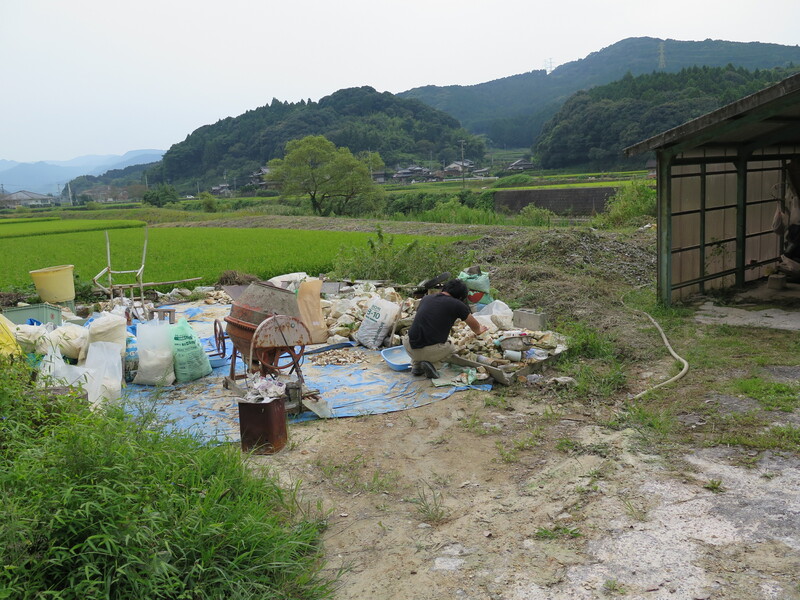 Tatsuya san has had a 40 year relationship with this clay making family and I am lucky to be able to tag along and reap that benefit. 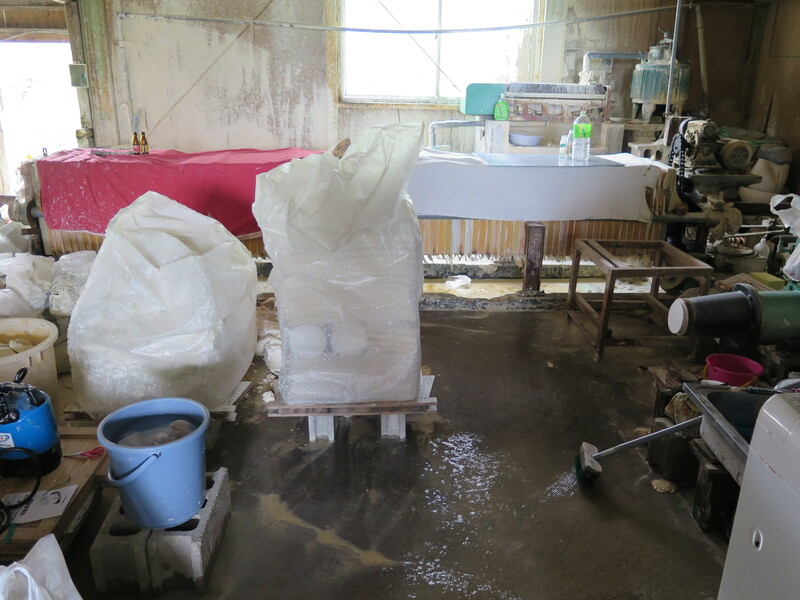 This entry was posted in arita, clay making, In the pottery, Japan, travel by hotnsticky. Bookmark the permalink.